Sign up for Broadjam today to follow Dana deChaby, and be notified when they upload new stuff or update their news! 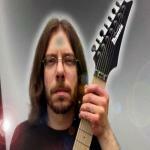 A guitarist for over 20 years, Dana deChaby has now completed what was surely his destiny, an all instrumental METAL album that features all of his diverse influences and study of music. From Mastodon to Mahler, it's all there in his debut solo album, DNA. Composed and recorded in his home studio, DNA features blistering seven string riffs and solos, advanced harmonies, crushing drums and acoustic and electronic interludes, while taking the listener on a journey. The destination?